Brandon Marshall has given us a reason to talk about the Dolphins for something other than how terrible they are, and it's because of what he intends to do during Monday night's game against the Jets. Apparently Marshall hasn't been himself during the season's first four games, at least according to Marshall. And who is Brandon Marshall? Best to let him explain. "I think the past four games have been tough for me, trying to control some things, and, hey man, I'm just going to let it out," Marshall said of his emotions. "I don't care if I have two, three cameras on me. I don't care if I have penalties. It doesn't matter; I'm going to let it all out. I don't care what you guys write or what the commentators say. I'm just going to play football. That's what I'm best at. I'm best when I play emotional. I'm best when I play with passion. You guys are going to see that on Monday Night Football. I don't know if it's throwing a football 15 yards in the bleachers, or getting a 15-yarder [penalty], or punting the ball and getting thrown out of the game. But something is going to happen. I'll probably get kicked out after the second quarter." Ha ha ha. Good one, Brandon. We all know you're joking, right? Brandon? Come on. Tell us you're kidding. This can't be for real. "I'm not joking. I'm serious. They want to fine me, hit me with a $50,000 fine. I'm going to play. The quarter and a half I'm out there, I'm going to play like a monster. I might get into a fight with Bart Scott. [Antonio] Cromartie, we pretty much matured our relationship a little bit. We used to fight in Denver and San Diego. If that happens, it happens. We'll see." Marshall has been diagnosed with Borderline Personality Disorder, for which he does not take medication, though he did say therapy sessions this summer made him realize he needs to "unleash his emotions," to use the Herald's words. Hey, whatever he feels is best. Dolphins coach Tony Sparano interpreted Marshall's remarks as a desire to be more passionate, or at least as Marshall's way of expressing a need to better channel that passion. 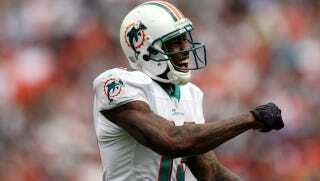 Marshall has dropped potential touchdown passes in all four of the Dolphins' games. His emotions, it would appear, are not the only part of his game of which he ought to get a better grasp.